This was the confident declaration of Peter Wilson, the then chairman of Sotheby’s, during his 1966 appearance on the BBC’s Money Programme. Though he was only eight years into his chairmanship, Wilson had already overhauled the fusty image of the art trade. His ingenious pre-sale marketing efforts, celebrity invitations, and black-tie sales had transformed Sotheby’s auctions into major news affairs, and deepened the perception of Christie’s as an antiquated rival. Reacting shrewdly to the post-war wave of prosperity, Wilson was determined to bring newly moneyed buyers into the fold. He sought to convince businessmen and bankers that collecting was no longer the exclusive preserve of cultured, old-money dynasties such as the Rothschilds, Rockefellers, or Mellons. Crucially, Wilson wanted to instill the notion that art can be an investment. The sudden and precipitous rise of the Impressionist art market during the 1950s may be cited as proof of this. If you inherited an Impressionist painting, you could now sell it for vastly more than your family paid to acquire it. Wilson’s idea just needed to be packaged in an immediate and compelling fashion. A year after Wilson’s television appearance, twenty-seven-year-old Geraldine Keen — now Geraldine Norman — received a letter in Rome. A graduate of Oxford University and UCLA, Norman had left her job as an editorial statistician for the Times newspaper in London to work for the Food and Agriculture Organization of the UN. The letter was a job offer from the paper’s City editor, George Pulay, asking Norman whether she would consider returning to London. He wanted her to spearhead a new editorial collaboration between the Times and Sotheby’s. As we diversify our holdings, we might spare a thought for Berthe Marie Pauline Morisot; she died on this date in 1895. A pioneering painter, she was one of “les trois grandes dames” of Impressionism (with Marie Bracquemond and Mary Cassatt). In February 2013, Morisot became the highest priced female artist, when After Lunch (1881), a portrait of a young redhead in a straw hat and purple dress, sold for $10.9 million at a Christie’s auction (exceeding the $10.7 million paid for a sculpture by Louise Bourgeois in 2012). As we lament labels, we might recall that it was on this date in 1972 that Vesna Vulović entered the Guinness Book of Records. A stewardess for JAT Airlines, she survived a fall of 33,330 ft. when (what is believed to have been) a briefcase bomb exploded on her flight, and she was sucked through the resulting hole i the fuselage. She was the sole survivor of the incident. In 1488 during the reign of Henry VII, one year after the Dominican Heinrich Kramer wrote his notorious witch-finding manual Malleus Maleficarum, an adolescent girl named Agatha Soothtell gave birth in a cave among the dales and moors of Yorkshire to her daughter Ursula, supposedly conceived by the Devil himself. Ironically it was there in “God’s Own Country” that young Agatha would raise her demonic charge, both of them forced to live in the cave where Ursula was born. The site that would be visited by pilgrims for centuries afterwards, making it arguably England’s first tourist attraction, was known as much for the strange calcifying waters of its subterranean whirlpool as for its medieval Satanic nativity. See also “Woodcuts and Witches,” an explanation of how the rise of the mass-produced woodcut in early modern Europe helped forge the archetype of the broom-riding crone. Then watch Häxan: Witchcraft Through The Ages, an extraordinary 1922 Scandinavian film by Benjamin Christensen. As you’ll see, it’s a curious (and groundbreaking) mix of documentary and silent horror cinema. Most films of the period were literary adaptations; but Christensen’s take was unique, based on non-fiction works, mainly a 15th-century treatise on witchcraft that he found in a Berlin bookshop. 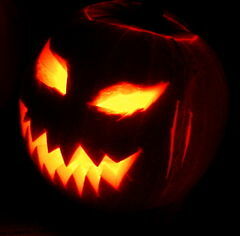 As we search for our eye of newt, we might note that today is All Hallow’s Eve, or Halloween. Many Halloween traditions originated from ancient pagan Celtic harvest festivals, particularly the Gaelic festival of Samhain, which was Christianized as Halloween in the eighth century, by Pope Gregory III. The original reason for disguise on Samhain was to prevent lonely spirits recognizing and snatching one away to their between-the-worlds home; it was an additional bonus that the costumes allowed you to lead a mini-riot without being recognized. The custom of trick-or-treating seems to date to the 19th century in England, when people went house-to-house in costume at Halloween, reciting verses in exchange for food, and sometimes warning of misfortune if they were not welcomed. It seems to have taken off in the U.S in the 1920s. The custom of making jack-o’-lanterns began in Ireland in the 19th century; “turnips or mangel wurzels, hollowed out to act as lanterns and often carved with grotesque faces,” were used at Halloween in parts of Ireland and the Scottish Highlands. Special Halloween bonus: Jacques Collin de Plancy’s Dictionnaire infernal, a monumental compendium of all things diabolical, was first published in 1818 to much success; but it was the fabulously-illustrated final edition of 1863 that secured the book as a landmark in the study and representation of demons. Read “Defining the Demonic,” then page through the 1863 edition at The Internet Archive (whence every item in this post). There are superficial people whom Grandville amuses, but as for me, he frightens me. When I enter into Grandville’s work, I feel a certain discomfort, like in an apartment where disorder is systematically organized, where bizarre cornices rest on the floor, where paintings seem distorted by an optic lens, where objects are deformed by being shoved together at odd angles, where furniture has its feet in the air, and where drawers push in instead of pulling out. 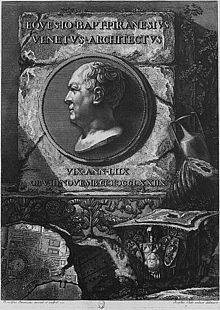 As we revel in the revolutionary, we might send finely-drawn birthday greetings to Giovanni Battista (also Giambattista) Piranesi; he was born on this date in 1720. An Italian artist, he is best known for his etchings of Rome and of fictitious and atmospheric “prisons” (Le Carceri d’Invenzione). 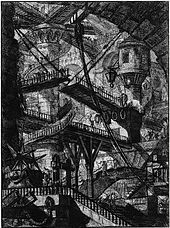 The latter, with their Kafkaesque, Escher-like distortions, influenced Romanticism and perhaps especially Surrealism. da Caravaggio used ivory black to convey asceticism, piety, and inspiration in his 1605-6 painting, St Jerome Writing. Black is technically an absence: the visual experience of a lack of light. A perfect black dye absorbs all of the light that impinges on it, leaving nothing behind. This ideal is remarkably difficult to manufacture. The industrialization of the 18th and 19th centuries made it easier, providing chemists and paint-makers with a growing palette of black—and altering the subjects that the color would come to represent. “These things are intimately connected,” says science writer Philip Ball, author of Bright Earth: The Invention of Color. The reinvention of black, in other words, went far beyond the color. As we paint it black, we might send a finely-limned birthday card to Jacques-Louis David; he was born on this date in 1748. A master of cerebral “history painting, he is considered the preeminent artist of the French Neoclassical period. David had a great many pupils and followers, making him the strongest influence in French art of the early 19th century, especially on academic Salon painting. Every so often you need a specific insult, and bumblepuppist is about as specific as they get. We will grant you that the game of whist is not as popular as it once was, having been edged out by newfangled card games such as euchre and canasta, but once upon a time whist was the most deucedly popular card game in the land. This ranks pretty high on the list of words which are likely inapplicable in your life, but imagine how excited you will be if you do meet someone who not only plays whist, but is bad at it, and you have the appropriate descriptor. Bumblepuppist is also sometimes rendered as bumblepupper, and the word for “whist played poorly or without regard for rules” is bumblepuppy (from bumble and puppy). “Bumblepuppy,” as defined by a renowned authority upon whist, is a game played by people who imagine that they are playing whist, but who in reality know nothing of that intricate game. As we test the limits of civility, we might send fascinating birthday greetings to Fernando Arrabal Terán; he was born on this date in 1932. A playwright, screenwriter, film director, novelist, and poet, the New York Times’ Mel Gussow has called him the last survivor among the “three avatars of modernism.” In 1962, Arrabal co-founded the Panic Movement with Alejandro Jodorowsky and Roland Topor, inspired by the god Pan. In 1990 he was elected Transcendent Satrap of The Collège de ‘Pataphysique, a “society committed to learned and inutilious research” (“inutilious” = “useless”). Forty other Transcendent Satraps have been elected over the past half-century, including Marcel Duchamp, Eugène Ionesco, Man Ray, Boris Vian, Dario Fo, Umberto Eco, and Jean Baudrillard. Arrabal spent three years as a member of André Breton’s surrealist group and was a friend of Andy Warhol and Tristan Tzara. A chess fanatic (a passion he shared with Duchamp), Arrabal wrote a chess column for the French weekly L’Express for over thirty years.